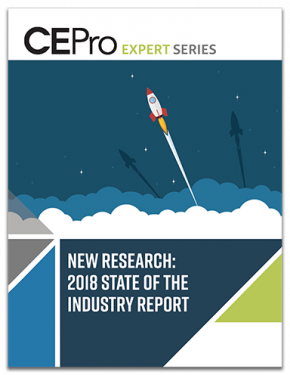 Download CE Pro's State of the Industry 2018 report, featuring research and exclusive statistics on the smart-home installation market. The typical custom installation company grew revenues by 11.4 percent last year, the biggest gain since 2015. This increase continues a streak of six consecutive years of revenue growth for smart-home installers following the devasting Great Recession from 2009 to 2011. The results of the 2018 State of the Industry Study reveals that many of the same market dynamics seen by last year's study are still there, but at even greater levels. For example, last year the study referenced that the Dow Jones Industrial Average was hitting it's all-time high at 19,200. Who could have guessed that just one year later the stock market would reach 24,200! The outlook is strong. Learn how to benefit from it in CE Pro’s 2018 State of the Industry Report. Download it today.